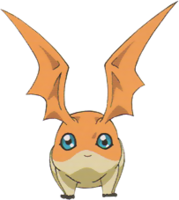 A Mammal Digimon characterized by its large ears. It is able to fly through the air by using them as large wings, but because it only goes at a speed of 1 km/h, it is said that it is definitely faster walking. However, it's very popular because its appearance is cute when it is desperately flying (though it seems that it doesn't feel the same). Due to its extremely obedient personality, its trainers are well-defended. 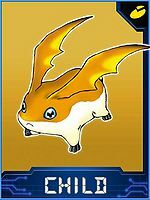 Also, even though Patamon doesn't wear a Holy Ring, it is able to exhibit its hidden holy power, and it appears to have inherited the genes of ancient Digimon. 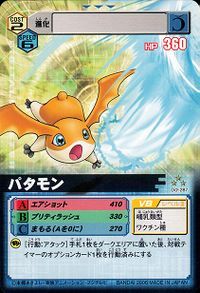 Its Special Moves are sucking in air then spewing an air shot out in one burst (Air Shot), and striking the opponent with its large ears (Hane Binta). 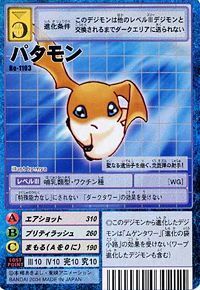 A Mammal Digimon characterized by its large ears. It is able to fly through the air by using them as large wings, but because it only goes at a speed of 1 km/h, it is definitely faster walking. However, it's popular because its appearance is cute when it is desperately flying (though it seems that it doesn't feel the same). Due to its extremely obedient personality, its trainers are well-defended. 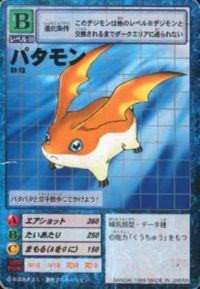 A Mammal Digimon characterized by its large ears. It is able to fly through the air by using them as large wings, but because it only goes at a speed of 1 km/h, it is said that it is definitely faster walking. However, it's very popular because its appearance is cute when it is desperately flying (though it seems that it doesn't feel the same). Due to its extremely obedient personality, its trainers are well-defended. 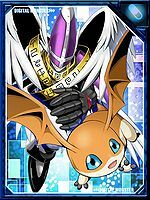 Also, even though Patamon doesn't wear a Holy Ring, it is able to exhibit its hidden holy power, and it appears to have inherited the genes of ancient Digimon. 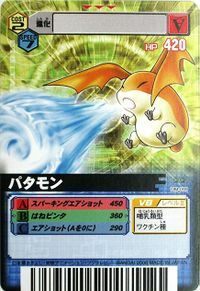 Its Signature Moves are striking the opponent with its large ears (Hane Binta), and sucking in air then spewing an air shot out in one burst (Air Shot). This profile matches the one used on the D-3 Toy site. 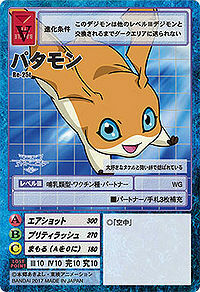 A Mammal Digimon characterized by its large ears. It is able to fly through the air by using them as large wings, but because it only goes at a speed of 1 km/h, it is definitely faster walking. However, it's popular because its appearance is cute when it is desperately flying (though it seems that it doesn't feel the same). Due to its extremely obedient personality, its trainers are well-defended. Its Special Moves are sucking in air then spewing an air shot out in one burst (Air Shot). 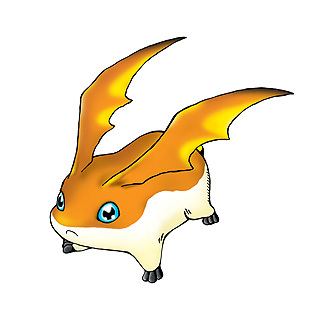 A Digimon whose special trait are its large ears. Although it can use its ears to fly in the sky, it's faster for it to walk as its flying speed is slow. 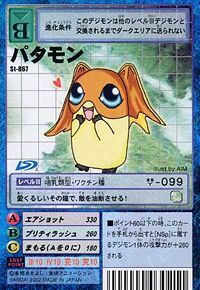 It is a highly popular Digimon, being obedient and having a straightforward personality. 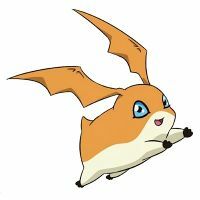 A Mammal Digimon characterized by its large ears. It is able to fly through the air by using them as large wings, but because it only goes at a speed of 1 km/h, it is said that it is definitely faster walking. 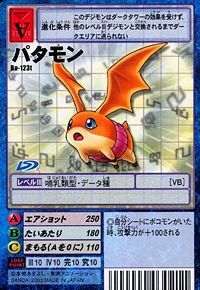 However, it's very popular because its appearance is cute when it is desperately flying, though it seems that it doesn't feel the same. Due to its extremely obedient personality, its trainers are well-defended. Adventure Adventure 02 Grandprix Adventure tri. | Pata is derived from patapata 「パタパタ」, onomatopoeia for the sound of "flapping". 3.1.8 Digimon Savers 3D: The Digital World in Imminent Danger! 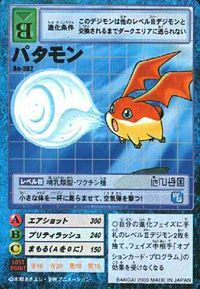 エアショット Ea Shotto Boom Bubble/Air Shot Inflates self with air and expels a shot of air. Fires an Air Shot while airborne. Tai Atari  Body Blow たいあたり N/A Slamming Attack Tackles the enemy. 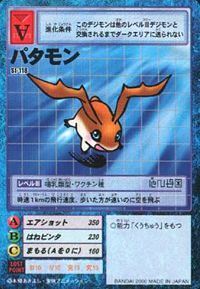 Hane Binta  Wing Slap はねビンタ N/A Rapid Wing Attack Slaps foe with its ears. Shoots forward through the air, hitting an enemy. Begins spinning in the air while attacking the enemy with its ears. Can release blades of wind. スパーキングエアショット Supākingu Ea Shotto Sparking Boom Bubble A glittering, powered-up version of Air Shot. エアーガスト Eā Gasuto Breeze Blaster Inhales in air and spits out multiple clouds. Breathes in air and shoots it out as blades made out of wind. Spins once on the ground, hitting an enemy with one wing. 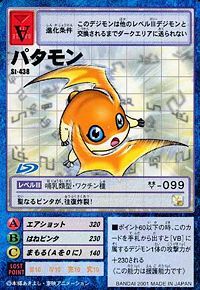 Tai Atari Bomb  Body Blow Bomb たいあたりボム Tai Atari Bomu Slamming Attack Bomb An attack where Patamon flies forward while spinning. Kūchū Tai Atari Bomb  Aerial Body Blow Bomb 空中たいあたりボム Kūchū Tai Atari Bomu Aerial Slamming Attack Bomb Dive bombs the enemy while spinning. 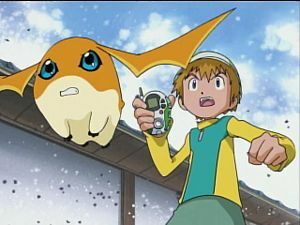 Patamon is the partner of Takaishi Takeru. 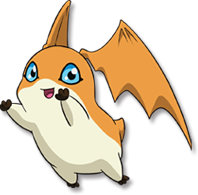 A different Patamon was introduced in Digimon Frontier. 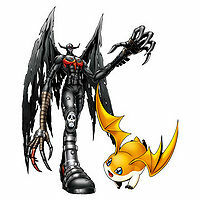 One of the Three Great Angels, Seraphimon was defeated by Mercuremon and had reverted to a DigiTama. 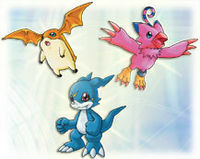 After being cared for by Bokomon, the DigiTama hatched into a Patamon, but sporting the same pink waistband as Bokomon. 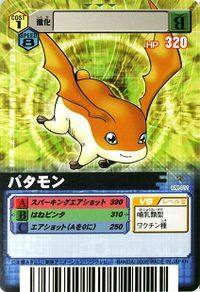 A Patamon was among the Digimon caught in the vortex that appeared when humans were deleting Digimon. On the first episode, Taiki is in a dream where a mysterious army is battling against Taiki's Digimon army. Patamon is part of that army. 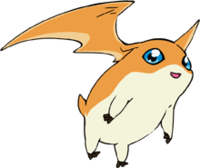 As a result to having severed under the Digimon Army, Patamon is one of the DigiMemories under Taiki's control. 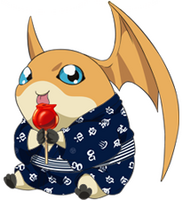 A Bakemon serving Lord Vamdemon disguises itself as a Patamon in order to trick Taichi and Zeromaru. 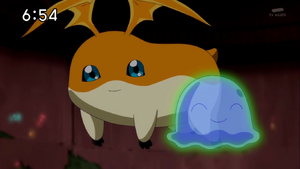 Patamon is the partner of Takaishi Takeru. Patamon helps the Chosen Children solve the problem in Odaiba. Izumi Koushirou asks Patamon to make sure that the sacred powers of the Four Holy Beasts are balanced. 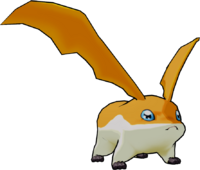 Patamon appears as an obtainable Child-level Vaccine type Digimon in Digimon World. 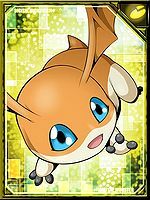 An Patamon is found bouncing around the north of Gear Savannah, to the east of Elecmon's tree and north of Piyomon's screen. If the Player talks to it, it will demand a battle, and when its defeated, it will demand another battle, and another, resulting into 3 fights. 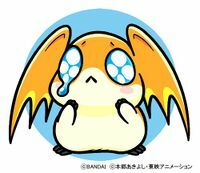 When Patamon loses all 3 fights it cries about not being too strong and finally decides to join the Village of Beginnings, where he joins along with Monochromon, Unimon and Piyomon in the Item Shop. 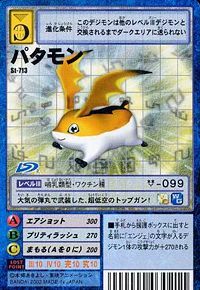 If Patamon is the third Digimon of the aforementioned ones to be recruited, a Card Machine will appear, and if Patamon was the first Digimon to be recruited, it'll build the Item Shop instead. 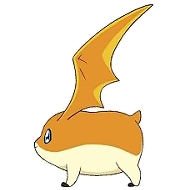 When the Secret Item Shop has been unlocked, Patamon's schedule will coincide to that of Mojyamon's, working from afternoon to evening. 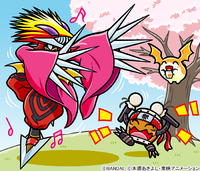 Another Patamon is pursued and bullied by a Goburimon in Gear Savannah when a Leomon hears its help cries comes and defeats the Goburimon, saving the Patamon. 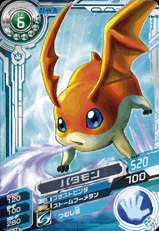 After that the Patamon is no longer seen in the game. Numemon (When you do not meet requirements for any other evolutions and at least 4 days have elapsed). Scumon (When its Poop meter is full). Nanimon (When you scold it and it has zero happiness and discipline gauge). Bakemon (Death Evolution. When it fights against another Digimon and loses a heart. This has a random 10% chance of happening so its reccomended to save before trying it). 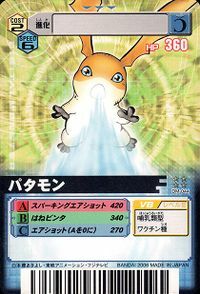 Patamon spits out a white bubble of hot air to the enemy. 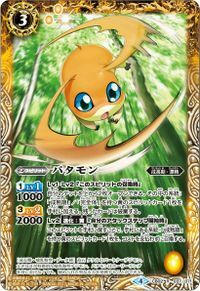 Patamon evolves into Igamon (0-2 DP), Starmon (3-5 DP), Wizarmon (6-7 DP) or Angemon (8+ DP). 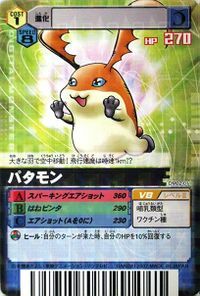 Patamon is an obtainable Partner Green Card. His armor evolutions are Pegasmon and Baromon. He is also the first opponent in Pyramid City's Extra Arena and partner of Takaishi Takeru. 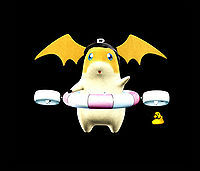 Patamon is a playable character and can evolve to Seraphimon. 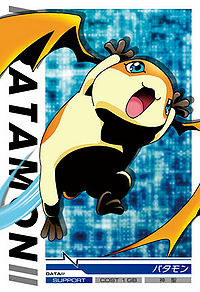 Patamon is a playable character. 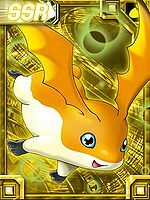 Patamon is an obtainable partner Digimon. It is available at the beginning of the game in both the Balance and Maniac Packs. 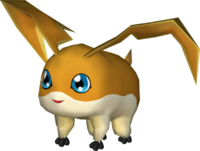 Patamon is a playable character. Has the ability to fly over obstacles. Can be evolved from Tokomon if above level 5, or can be found at Tokkun Mountain. He can evolve to Angemon if above level above level 13 and Holy EXP above 30. 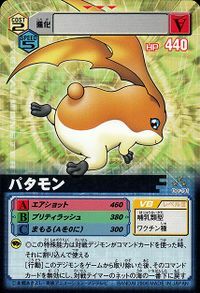 Patamon is an obtainable evolution of Gaomon. Can be evolved from Tokomon if above level 8 and friendship 50%, or can be found at Login Mountain. Can evolve to Angemon if above level 19, friendship 70%, and Holy EXP 300. Can be evolved from Tokomon. 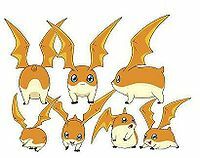 Patamon is an obtainable Digimon which is evolved from Tokomon, and can evolve to Angemon, Devimon, Garurumon, or Tailmon. It can also be obtained as a collectible card. Evolves from Tokomon. Can evolve to Unimon, Centalmon, Ogremon, Bakemon or Scumon. 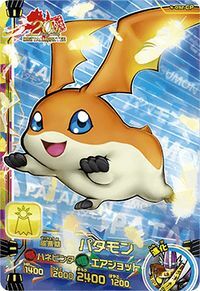 Patamon is a partner Digimon. Evolves from Tokomon and can evolve to Angemon. Evolves from Frimon. Can evolve to Aquilamon, Liamon, Pegasmon or Revolmon. 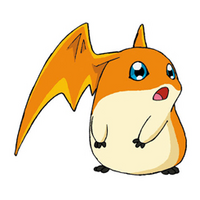 Patamon is an enemy Digimon. Evolves from Tokomon. Can evolve to Angemon, Devimon, Leomon or Nanimon. Let's go out for a flapping walk in the sky! It flies even though its flight speed is only about 1 km per hour and it would be faster to walk. 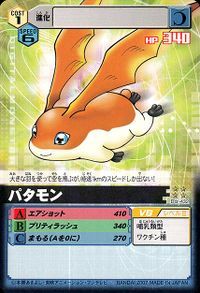 This innocent Digimon flies with its large, wing-like ears! Its holy slap explodes back and forth! Armed with atmospheric bullets, it unleashes its super-low altitude top gun! Its cute eyes cause the opponent to let their guard down! It inflates its small body greatly and fires an air bullet! This air-bullet shooter has inherited holy genes! It is connected to Takeru, whom it loves greatly, through deep bonds. I'll go wherever Takeru goes. He flies the skies using his large wings, but can only put out a speed of 1km per hour! It travels through the sky with its large wings! Its flight speed is 1km/h!? A Mammal Digimon with a very honest personality. It can fly through the sky by using its large ears as wings. 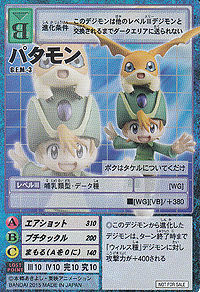 This small Digimon is said to be able to display holy powers, despite not wearing a Holy Ring. Although it is capable of flying using its large ears, because it can only reach a maximum speed of 1km/h, it would be faster for it to walk. While it does not have a Holy Ring, concealed within it are the genes of ancient Digimon. 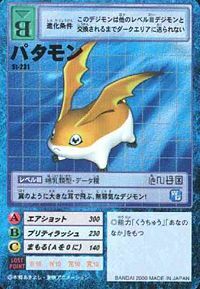 A Mammal Digimon whose defining characteristic is its large ears. While it is able to fly using its ears as wings, it is only capable of reaching a flight speed of 1km/h, where it would be faster to walk. Takaishi Takeru's Partner Digimon. It is a Mammal Digimon characterized by its large ears. 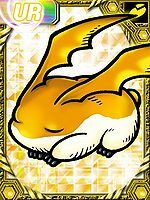 Even though Patamon doesn't wear a Holy Ring, it is able to exhibit its hidden holy power. 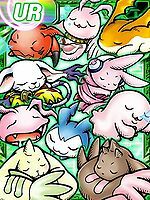 Digimon Adventure Fes. 2017 Digimon Adventure tri. Digimon Adventure tri. ↑ Digimon Adventure: "Adrift? The Island of Adventure!" ↑ Digimon Adventure 02: "Digimental Up"
This page was last modified on 13 April 2019, at 12:44.